Description: Cephalis truncate spheroidal, generally rough- surfaced due to overgrowths on pore bars and/or small nodes at pore bar junctions. Pores circular to subcircular. relatively large, irregularly arranged. Two prominent, stout, bladed horns present (both are extensions of internal elements - see below) - apical horn generally curved proximally. extends upward from upper anterior of cephalis: vertical horn straight, generally shorter than apical horn, extends upwards from posterior base of cephalis at 10-20° angle. Collar stricture not always well defined but generally seen as slight constriction. Thorax truncate conical to campanulate, always wider and longer than cephalis. Pores larger than those on cephalis. circular to subangular, roughly arranged in longitudinal rows but irregular in size distribution. Terminates in up to ten bladed feet, irregularly distributed around distal margin. Feet not seen to be associated with any internal elements. Where feet are well developed weak peristome generally apparent in form of narrow, poreless bars between feet, sometimes with weakly developed spines extending downwards from them (pl. 2. figs 11,12; pl. 7, figs. 8, 9). Internal skeleton consists of bars M, D, A, Al, V, LI, Lr, ll1, Ir1, spine Ax and arches A-Ll, A-Lr, V-Ll and V-Lr (text-fig. 6; pl. 7, fig. 10). M very short. Ax reduced to a node. D generally trifurcates before joining thorax, central trifurcation sometimes extends outside thorax as very short wing (pi. 2. figsl 1.12; pi. 7, fig. 9). LI and Lr bi- or trifurcate but do not penetrate thoracic wall. V very thin, extends upward at angle to collar stricture, penetrates to become vertical horn (see above). A extends upward from M to anterior wall of cephalis. continues outside as apical horn (see above). Al branches from A to join shell wall at collar stricture but does not penetrate outside. From approximately same point as A. A-Ll and A-Lr extend downward and join to LI and Lr at thoracic wall. Bars ll1 and Ir1 join, but do not penetrate, shell wall at collar stricture. V-Ll and V-Lr extend downward along inner wall from V at collar stricture and join to LI and Lr respectively. Arches A-Ll, A-Lr, V-Ll and V- Lr may create externally visible furrows (pl. 7, fig. 9). Dimensions: Holotype (range of 25 specimens): length of apical horn: 60µm (35-68); length of cephalis excluding apical horn: 35µm (32-45); width of cephalis: 45pm (42-68); length of vertical horn: 35µm (15-51); length of thorax excluding feet: 65µm (50-86); width of thorax excluding feet: 85µm (75-105): number of bladed feet: 10 (7-10). Etymology: Te Kopua is the Maori name for the Point that is one the localities where the Puriri Formation outcrops and which yields excellently preserved specimens of Lophophaena tekopua. It is used as a noun in apposition. Holotype: R170 (Plate 2, figures 11, 12). Type Locality: Matakohe Quarry, Q08/179638. Discussion: L. tekopua differs from most other species of Lophophaena by having well developed vertical and apical horns. It is distinguished from the similar C. stigi (see Lithomelissa stigi Bjorklund 1976. p. 1125, pl. 15, figs. 12-17; Ceratocyrtis stigi, Nigrini and Lombari 1984, p. N13. pl. 15, fig. 7) - transferred from Lithomelissa by Petrushevskaya (in Petrushevskaya and Kozlova 1979) - primarily by having bladed vertical and apical horns and bladed terminal feet. The internal skeleton of C. stigi was not described in detail so comparisons cannot be drawn between the two on that basis. On a purely morphological basis it appears that C. stigi should be placed in Lophophaena because it has a large cephalis and well developed vertical and apical horns (see above), especially the holotype (see Björklund 1976, pl. 15, fig. 15), and it appears that A is not free to the top of the cephalis (see Lithomelissa, above). L. tekopua differs from L. (?) thaumasia Caulet (1991, p. 534, pi. 2, figs. 5, 6) by having terminal feet rather than a ragged termination, a more definite collar stricture and generally longitudinally aligned thoracic pores. Sugiyama and Furutani (1992, p. 205, pl. 13, fig. 13, pl. 18, figs. 6a, b) described a species which they called Ceratocyrtis (?) sp. aff. Ceratocyrtis stigi. 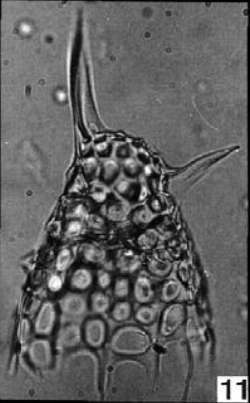 It appears similar to L. tekopua but does not have bladed feet, the thoracic pores are more regular in size and distribution and the apical horn is not associated with A. Abelmann (1990, p. 694, pi. 4, fig. 12) illustrated as C. stigi a specimen which differs from L. tekopua primarily by having a conical, rather than bladed, apical horn (the vertical horn appears to have been broken off). It looks similar to L. tekopua, assuming that it possesses a vertical horn, but lacks the bladed terminal feet and generally longitudinally aligned thoracic pores. Caulet (1986) illustrated as Pseudodictyophimus sp. a specimen that resembles L. tekopua but has a smaller cephalis and a very large apical horn. No details are given as to why it was placed in that genus and the illustration is not clear enough to see if there are ribs in the thorax, a criterion for inclusion in Pseudodictyophimus. Range: Lophophaena tekopua has been observed from the Cryptocarpium ornatum Zone to the Cyrtocapsa tetrapera Zone (early Oligocene to early Miocene (late Runangan/early Whaingaroan to Waitakian)).